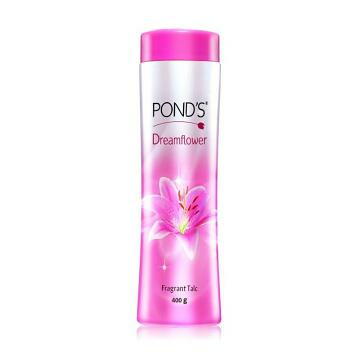 Ponds dreamflower talcum powder envelopes you with alluring aroma and sparkle. This gentle powder softly caresses your skin while providing long lasting protection against body odor and perspiration. Remain clean and fresh all day long with this satin textured powder. Loaded with natural ingredients, the powder is gentle and effective and also provides instant fairness to your skin. Even out your skin tone and make it look non-patchy or oily with this powder. It is also easy to apply. Buy the Ponds dreamflower talcum powder now, so you can present yourself confidently even on the hottest days. This item in Bath & Shower category was first added to our catalog on 03-27-2019. Buy POND'S Dreamflower Fragrant Talc, Pink Lilly, 400g, sold & shipped by Mahavir Wholesale where you can shop online for Grocery Products of India - Patanjali, Chai, Henna & Beauty Items. This Bath & Shower collection has been tagged as skin care, natural skin treatment, after shower body talcom powder.